A bottle of Belberry royal selection Seville orange sauce imported from Belgium had been lingering in my pantry for a while, awaiting a luxury moment. 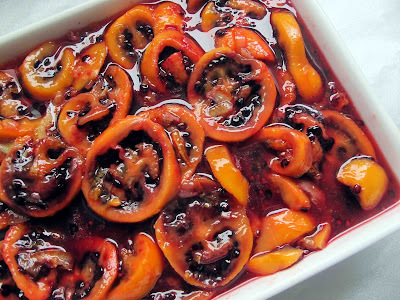 The bright jewel colour and intense bittersweet fruit taste of this sauce was a perfect match for these crimson tamarillos. For good measure, and even more complexity, I added some Te Mata Fig Sauce. It made an incredibly easy dessert for two of our special friends. Once peeled and sliced the tamarillos were just left to soak in this ambrosial liquid for a while before serving. 4 tablespoons of Te Mata fig syrup. 4 tablespoons of brown sugar. 125 ml of Belberry royal selection Seville orange sauce . Pour boiling water over the tamarillos and leave to stand for a minute or two. Pierce each tamarillo with a knife. The skins should peel off easily now. Slice the tamarillos and put them in serving dish in a single layer. Mix the Seville orange sauce with the Te Mata fig syrup and the brown sugar. Pour over the tamarillos and allow them to absorb the flavours for an hour or so, stirring from time to time. Can be served warm or cold with yoghurt or ice cream. Any leftovers can be stored in the fridge and will taste even better the next day with cornflakes and thick Greek yoghurt.